For this project I wanted to create an unknown collaboration between many significant art Museums who are present on twitter and myself. To do this, I created a light-up “Art” sign which becomes illuminated when these institutions post a new status. I was interested in the conversation surrounding these institutions’ role in art and wanted to approach it with a kitsch aesthetic. I thought the piece touched on many factors such as the distance between the artist and institution and what value does/can an institution bring to an artwork. I was also interested in seeing the real-time stream of data from these museums as a way to observe the frequency of their activity through this means of communication. 1. Twitter seems as though it can be an constant stream of information at times and I would like to make a stream of liquid controlled by pressure either being applied or released by a servo motor. When twitter messages were posted to my accounted the stream of liquid would flow. When there were no tweets, the servo would cut off the water supply. This would be a way of physically measuring the amount of data provided to us in a real-time format. 2. I am interested in having an event triggered when a chosen twitter source posts a tweet and was inspired by Ellie Harrison’s Vending Machine, (http://cmuems.com/2011/a/10/11/vending-machine-ellie-harrison_lookingoutwards4/). I primarily follow art institutions on my twitter account and was thinking about triggering an action or projection in response to those particular sources. 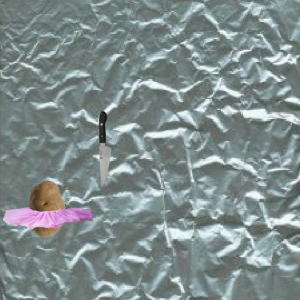 I am still thinking about exactly what this action or image would be and its significance. Perhaps using the tweets from these sources to generate a drawing or art of my own, creating a somewhat un-known and removed collaboration with these institutions. 3. Following the same thought process described in idea #1, I am considering making a kinetic sculpture, using motors connected to an arduino, that’s movement would be dependent on receiving tweets from a chosen source. Possible ideas to explore are how lines of formality and casualty are treated with online medias. I am also interested by the increased accessibility that twitter provides to a large amount of information in a brief format and feel an action could be created to exemplify this as well. The Company, Bring To Light NYC from Andrea Cuius on Vimeo. Sonoridades Líquidas [Liquid Sounds] from Rui Penha on Vimeo. Sonoridades Liquidas [Liquid Sounds] is an installation created by Joao Rcardo de Barros Oliveira and Luis Girao for the Casa da Musica in Portugal. 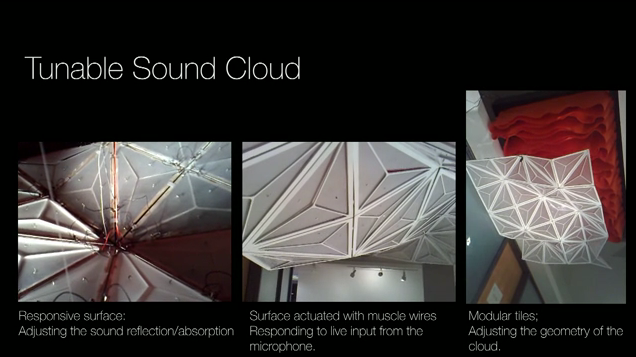 It is an interactive installation of “Sound Sculptures” that when activated, create abstract dissonant sounds. Oliveira and Giaro use of materials such as water, glass and metal to create these sounds. Multiple sculptures make up the installation space and are connected to each other through an Arduino. This enables the sculpture to not only individually interactive but to also respond to each other. 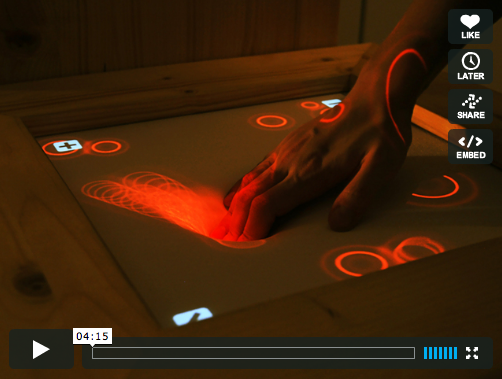 CRAFT Video: Craft Meets Tech at MIT from MAKE magazine on Vimeo. The Media Lab at MIT is interested in blending “High” and “Low” technologies to create unique and interesting applications. I thought this video provided some helpful ways of integrating the Arduino and other technologies into more traditional art mediums, such as paper, paint and even fibers. I really like the idea of conductive paint and the fairly inexpensive ways to make a circuit flexible by using conductive fibers. I thought many of the methods shown could be helpful or used as a spring board for future projects in our own class. Tunable Sound Cloud 1.0 was created by Fishtnk and responds in real-time to in-comming sounds to enhance the “acoustic performance” of a space. The piece consists of 3 parts; a sound absorption layer above, an acoustic chamber in the middle and finally the sound reflective surface. I like the some what twitchy movement of the sound reflective surface and it seems to resemble breathing at some points. I think this piece would be interesting at an even larger scale to encompass the ceiling of a room. 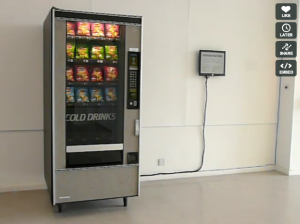 Vending Machine was created in April of 2009 and is a humorous commentary on the economic recession. Harrison reprogrammed an old vending machine to “only release packets of crisps when news relating to the recession [made] the headlines on the BBC News RSS feed”. 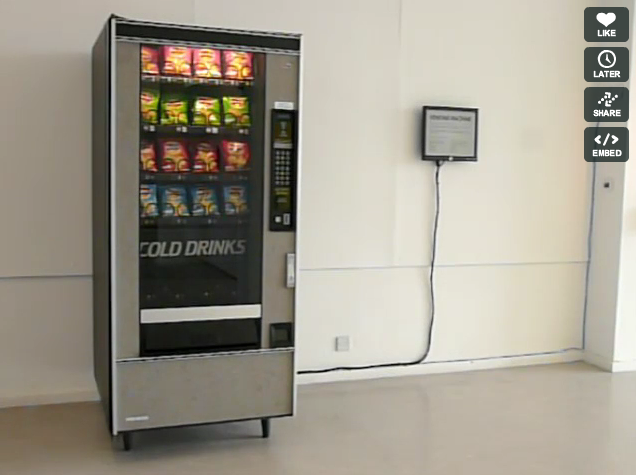 A monitor installed alongside the vending machine displays the incoming news feeds for the audience to see. I enjoyed that the typical user interface of the vending machine was over ridden by Harrison’s program which gives the machine an odd comical life of its own. 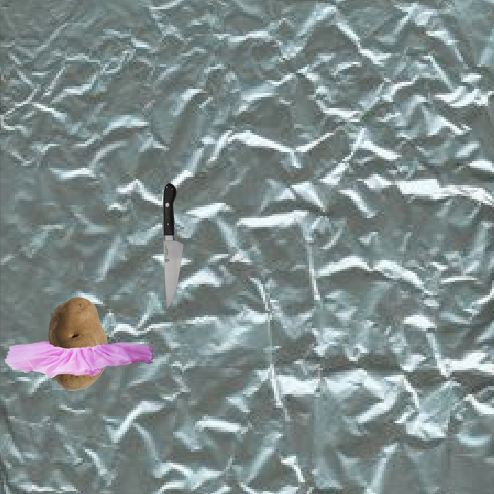 I thought the idea of integrating programming into an everyday object made for an interesting piece. Impress was created by Silke Hilsing and is a soft interactive display surface that response to touch. Hilsing uses the depression created in the surface when touched to add another layer of interaction than the usual “touch screen”. In her video she demonstrates the Impress being used as an application for 3D modeling and to make music. The Impress is built by sandwiching force sensors between two pieces of foam and then covering them with an elastic piece of fabric. A projector and camera are mounted above the screen to enable the users interaction. I found this project interesting because its construction is feasible to recreate for future projects. It is a fun and unique interface that I believe will encourage users interaction due to its tactile property. 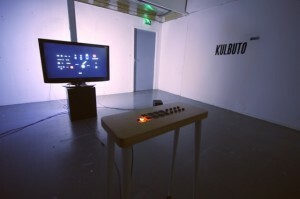 Émile Sacré created Kulbuto which is an installation of an instrument that creates visualization of the sounds made. 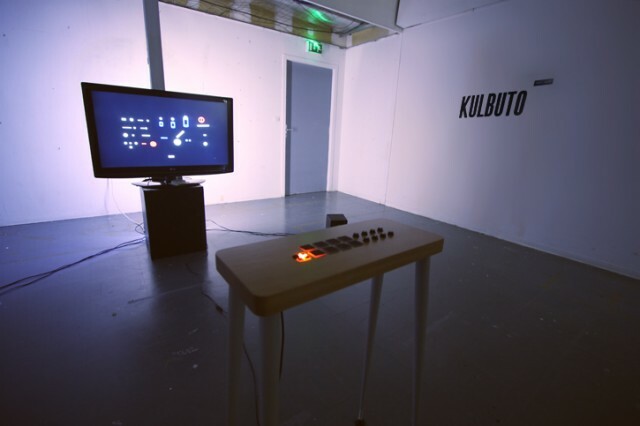 Kulbuto explores the “possibilities of non-uniform compositions” by integrating both the sound created from the instrument to create visuals and then using the visualizations to create the rhythmic cycles. Kulbuto is based on the “principles of changing rates” which determines the graphics and how they develop over time. I found the aesthetic of this piece to be very interesting and appreciated the inter-relation of the sound and visual aspects rather than just on affecting the other. The installation looks inviting and fun to engage with.